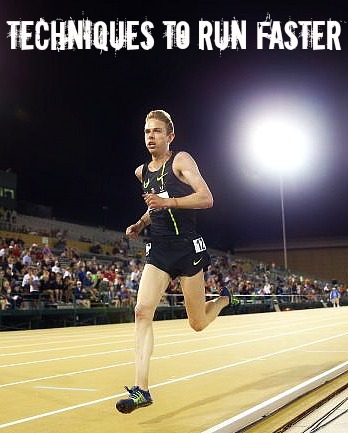 It takes more than just landing with a forefoot strike to run fast. Other techniques to run faster, doesn’t include moving the legs more rapidly, but by leaning forward more. We’ve all heard about the lean in Pose Running , but some aspects of Pose Running, such as the forward lean, reflects the forefoot running style of many great Ethiopian distance runners like Tirunesh Dibaba. Leaning forward in forefoot running coupled with the pull of gravity helps accelerate the body with greater ease compared to heel strike running. Romanov & Fletcher, 2007. Sport Biomech. Adding a forward lean reduces the distance between the hip and foot strike position which in turn, reduces deceleration of the body at each step. Therefore, leaning forward exacerbates forward momentum in forefoot running. Many runners, especially heel strikers, think that to run faster, they must move their legs faster; however the trouble with this is it’s extremely energetically taxing. Because heel strikers run more upright (shown below), that is, they don’t lean, they must forcibly increase their stride length and stride frequency to accelerate. This high mechanical requirement of the leg intensifies the challenge to sustain faster running speeds without compromising energetics. In a sense, the biomechanics of heel strike running conflicts with moving in the forward direction under gravity’s influence. Fortunately, leaning forward in forefoot running provides a better solution for acceleration without expending too much energy. The action of leaning or shifting the body-weight forward in forefoot running requires less metabolic energy because it simply reduces the work against gravity. To complement leaning forward, forefoot runners do not drive the leg swing forward (no high knee drive). This is how the legs save energy in forefoot running because the leg musculature is not used for propulsion, rather the body is falling forward and all the feet do is try to catch up with the body and act as platforms to prevent the body from falling down to the ground. This is why when you observe most Ethiopian distance runners run, you will notice they look as if they are ‘jogging’ when running at an extremely fast pace. It is the forward lean, not rapid leg movement that contributes to speed. Hence why their cadence does not change with pace variation. But how do you know where to lean from? Pose Running recommends leaning from the ankles, but I have always found this to be tricky while forefoot running. What works for me is the concept of ‘body-weight position’. I perceive my body-weight (center of mass) to be concentrated in my chest and my chest acts as a giant weight that pulls me down in the forward direction. This works for me because I, along with many other runners, had a hard time of leaning directly from the ankle and avoid over-leaning or leaning from the waist. Romanov, N and Fletcher, G. Runners do not push-off the ground but fall forwards via a gravitational torque. Sport Biomech, 2007; 6(3):434-452. How Did You Learn to Run?